Kawhi Leonard shoots against the Detroit Pistons on Jan. 12. Among Kawhi Leonard’s many, varied talents is something relatively new this season: Without much warning, and in addition to his stellar defense and rebounding, the Spurs forward has become one of the most devastating 3-point shooters in the league. Leonard currently ranks second among qualified players in 3-point accuracy, having knocked down a ridiculous 48.4 percent of his threes. Before this season, his career high had been 37.9 percent (on 2.8 threes per game) and his high for attempts per game was 3.0; this year, he’s taking 3.8 per game and shattering his career numbers. Merely putting a shooting threat of that magnitude on the floor can dramatically grease the wheels of offensive efficiency: Since 1997-98,1 teams whose regular lineups featured a guy hitting at least 45 percent of his threes scored 2.7 more points per 100 possessions than their peers. But Leonard is more than just a long-distance sniper. On top of his range, he also rates among the league’s best defenders (his +3.4 defensive Box Plus/Minus is in the 97th percentile of NBA players) and scorers (95th percentile in points per 36 minutes), with above-average rebounding (69th percentile in rebound rate) and passing (57th percentile in assist rate) thrown in for good measure. Leonard’s all-around excellence this season has placed him squarely in the mix with Stephen Curry, Russell Westbrook and LeBron James for the mantle of NBA’s Best Player™. 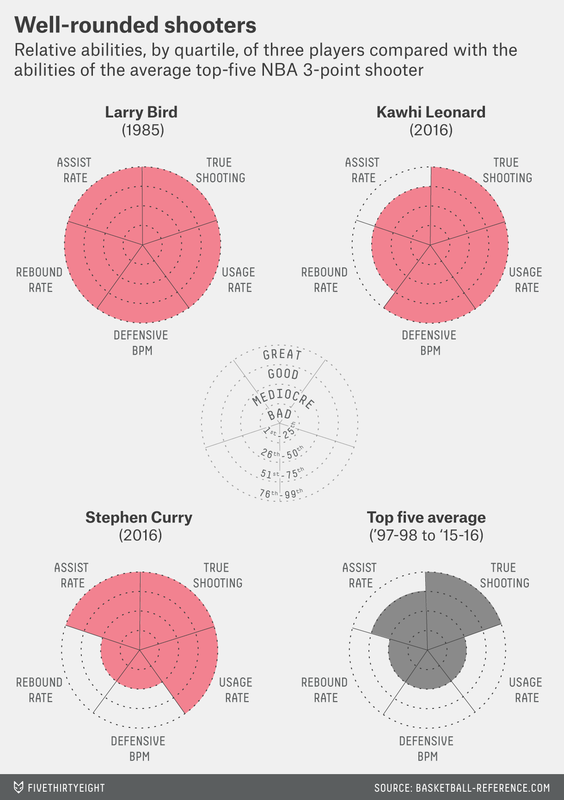 As my colleague Ben Morris wrote last month, Curry has emerged as the face of the 3-point revolution sweeping across the league in recent seasons. Along those lines, you might also expect that Leonard is ushering in a new era of great shooters who also excel in other facets of the game — a sort of apex predator among the 3-and-D genus. But Leonard doesn’t symbolize some broader trend threatening to transform basketball, primarily because he’s far too unusual for anyone in today’s NBA to measure up. The typical sharpshooter at the level of Leonard this season is, and always has been, limited in other areas. Going back to ’97-98 again, the average top-five-ranked shooter by 3-point percentage profiles as follows: a highly efficient scorer2 and solid passer who’s also in the bottom half of NBA players in usage rate, the bottom third in defensive BPM and close to the bottom quarter in rebound rate. So, by and large, these are not all-around dynamos — they’re in the game to shoot the lights out, and maybe do a little ball handling. Anything else is gravy, but outside the job description. We should note that this profile isn’t really trending in a different direction over time. Leonard’s compatriots atop the 3-point percentage leaderboard this season are J.J. Redick, Omri Casspi and Jared Dudley — a trio not exactly known for superb all-around skills. Even Curry, who ranks fifth (absurdly, on more than twice as many 3-point attempts as anyone else in the same neighborhood accuracy-wise) is merely an OK rebounder and defender relative to the league. That Leonard rates so well in non-shooting categories is basically unheard of for a marksman of his caliber. Well, unless you consider Larry Bird. In 1984-85, Bird hit 42.7 percent of his treys (good for second in basketball — and remember, the league shot 28.2 percent back then) while ranking in the 87th percentile in scoring efficiency, the 96th percentile in usage, the 87th percentile in assist rate, the 83rd percentile in rebound rate and the 94th percentile in defensive BPM. Maybe that defensive number is a bit of a stretch, the residue of estimated statistics in a pre-SportVU era, but Bird was also better defensively than he sometimes gets credit for. In any case, among top-five-ranked 3-point shooters in a season, Bird’s 1979-80, ’84-85 and ’85-86 seasons are the only ones remotely comparable to Leonard’s 2015-16 in terms of all-around versatility. Nobody else comes close. That doesn’t mean Leonard is a perfect analogue for Bird, but it does underscore the rarity of his talent and the infrequency with which a world-class shooting stroke is packaged alongside other elite basketball skills. Perhaps most tantalizing of all, Leonard is only 24; he still has time to get even better. The year the league moved the 3-point line back to its current distance of 23 feet, 9 inches. Practically by definition, given the shooting percentage required.